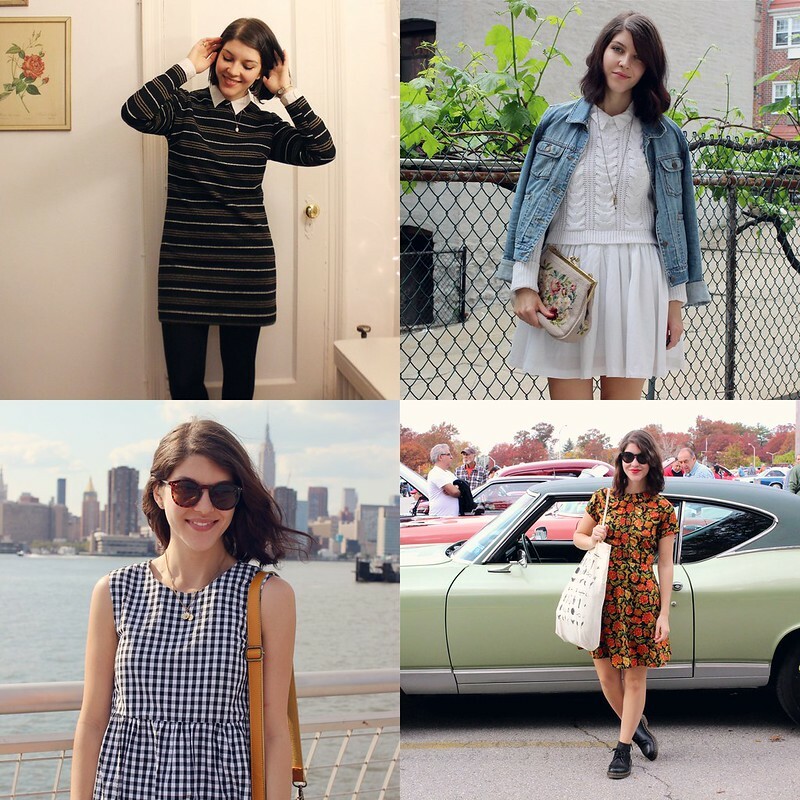 After reading Madelynn's posts about "the perfect wardrobe" it dawned on me that I've subconsciously been editing my own in a similar way for the past few years, albeit without such an articulate thought process. My wardrobe feels the most me its ever felt and when I get dressed I'm not (usually) plagued with "I've got nothing to wear". After several moves and closet cleanings, there's only room for things I love. What I've got now feels like the base of what will continue to be my version of the "perfect wardrobe." Having a blog I'm able to click through and categorize each style phase I've gone through and wonder what I was thinking. I can also see items I wear over and over and the ones that made a one time appearance and judge from there how wise an investment they may have been. I've slowly but surely weeded out the faded remnants of my college jeans and over-sized tees keeping only one or two sentimental things I can't bear to part with. Next came the clothes of my first grown-up-girl job, made up mostly of H&M, Gap and second-hand JCrew; keeping only those beloved things like my cherry blossom dress and perfect Swiss-dot button down. When I moved out of NYC to live with my boyfriend I didn't want to clutter up our shared home. I tried on everything I owned before deciding which would make the closet and which would go to the giveaway bin. Shedding the uncomfortable and ill-fitting stuff was hard because I LIKED so many things, but didn't love them. My "love meter" was set at: Have I worn it this year? Why not? And then being strict about it. Editing isn't just about getting rid of things though and small purges when things wear out and big ones when moving or de-cluttering all lead to extra space. By being so careful with removing things from my life, I want to be just as careful when bringing in new ones. Making lists of places my wardrobe feels sparse or basics that need updating keeps me from impulse buys that end up being wasted later on. For a long time I avoided sales and the mall, but now with specific goals in mind I feel safe browsing the racks once in awhile. For a real challenge, I'm only allowing myself a few key items each season that will be considered additions and investments. 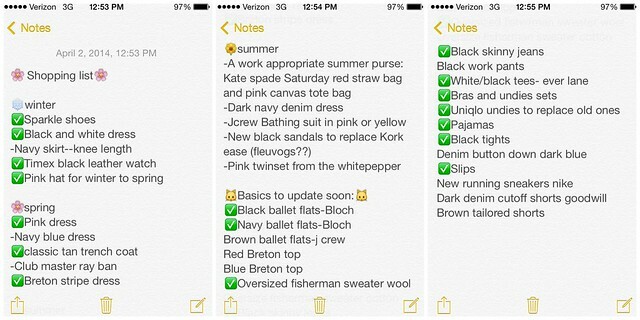 I even have a handy list on my phone so its always with me to save me money and the guilt of buying something that might languish in closet purgatory forever. Here are my lists, I can't believe I'm sharing them finally after mentioning over a year ago. Its very rough usually, just little ideas and things I'm debating between. It was pretty organic how I came to my "base wardrobe": When I moved I re-organized my closet by color and around that time happened to see some articles about the "French woman's wardrobe" (whatever that means) and the idea of having a daily uniform. This idea, that is supposedly quintessentially French, of having a very basic pared down wardrobe that is like a uniform of sorts where every piece works well with every other and then only adding one or two key new things each fashion-season is what makes French women so enviably chic. Just eyeballing my new closet clued me in to my own color palate. Most of the guides will say to stick with neutrals or all black and white, I'm not having any of that though. 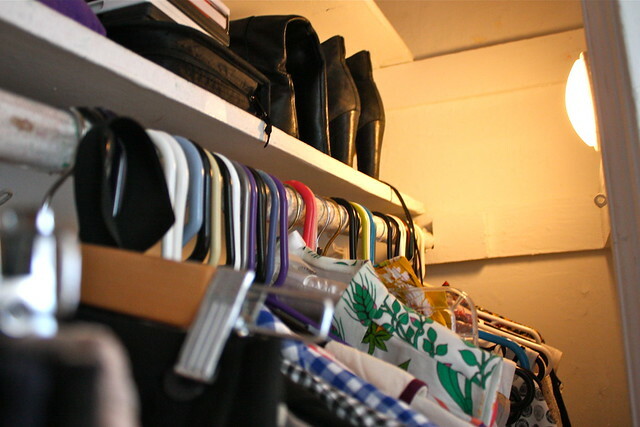 When I reorganized my closet by color I realized that some colors outweighed others and in order to make the clothes work together, I started using my previous choices as a guide. Black, white and browns round out my neutrals while in the winter and fall I gravitate towards deep reds, burgundy's and navy with the odd green piece here or there. In the spring and summer I'm drawn to golden hues, rich pinks and true-blue. Scroll through below to see the colors I love. For years I've been aware that there are certain cuts of clothes that I always love and others that I avoid no matter how in they are. I tend to gravitate towards feminine 60's inspired shapes like shift dresses, a-line skirts and fitted tops. Conversely, I love over-sized pullover sweaters and skinny jeans (must be a remnant of my lazy college days). I stick to the shapes that make me feel good and tend to pair well together and here is where I really make no exceptions. A lot of this has to do with my acceptance of my own body, which I'll talk about at length another time, but when I'm out shopping or just thinking about how I want to look that day I feel my very best in clothes that fit me, rather than clothes I fit in. For example boyfriend jeans will never be a thing I try, unless I literally wear my boyfriend's jeans as a joke. The reason is because I don't think they are flattering on me and if I don't think it makes me look good, I won't feel good wearing it. Now that I feel like I have a good base its all about being choosy. I want to be more thoughtful about the waste that is fueled by the fashion industry and by buying long lasting items, recycling and buying second-hand I'm creating less waste. I'd also like to buy from companies with sustainability models that are ethical in their business practices. Along with that, I'm challenging myself to only buy a few things a season and then make them last for a long while. I'll be writing about this more as I gather more tips to share as I continue in my wardrobe makeover. I've been clearing out a lot of stuff lately (moving in a few months) and altering anything that still has potential. I'm finding I always end up making the same alterations - skirts all the same mini length, dresses more fitted at the waist, clean a-line shapes rather than gathering, adding sleeves or wider straps to tops... so why don't I just always buy the same shapes? I'm definitely going to do more of that now. it's also weird where I live now because I don't really have many friends my own age, everyone here is older and has kids so I feel kind of out of place wearing the more fun stuff I would usually wear back home. I know I'm young enough to wear short skirts and girly dresses and sparkles but everyone else dresses so conservatively and I really don't want to emphasise that I'm 10-20 years younger than everyone every time I go out. that and the constant year round heat makes it hard to know what to throw out, even if I haven't worn it in a year, I used to wear it a lot in Australia so have I grown out of this style or will I go back to it when I go home? arrggghh! I really liked this post! I feel the same way about editing my wardrobe, and it was really helpful to see your actual lists of items. I'm graduating college in May and need to start getting some ~work attire~ and it's great to see how you've incorporated that. Making a list of what you want and avoiding sales is a great idea - impulse purchase danger!!! Also, which Everlane t shirts do you get? I bought the boxy pocket tee and I wasn't super in love. Really?? I'm so in love with those tees that I almost cried when I went on the site last week and they didn't have them. The nice customer service lady assured me they'll be back though. I also liked the U-neck one I got but it runs HUGE, so I'll try to get another one soon and see about it. When I graduated it was a disaster. I had no idea how to dress like an adult (but part of that was because I went to school in the middle of nowhere). Glad you liked it! I'll be posting a lot more about this in the coming weeks. This is such a good post! It feels very liberating to just KNOW what you need, to eradicate doubt, to just wear what you feel comfortable and fab in. Especially when you have a fulltime job. I love hearing how other people choose their wardrobe, I love your wardrobe though and would happily steal it all! This is so great and exactly what I've been trying to do. I have been feeling the need to pare down what I have and get really nice basics. I'm sure your post will help me on the road to a closet I love! Well you know I'm a big one for quality and colour over quantity and blah (and also that that doesn´t stop me from buying wedding dresses, harrumph). I love your lists! I feel the main thing I need to get more wardrobe in line is a chest of drawers. If I could just see what was going on that would be a huge improvement. I love this post :-) I always Thrift shop and then donate the things I grow out of! It so bad how big companies make there clothing I hardly buy from them anyway but I will definitely not anymore! I am going to try and find more Ethical fashion brands and make my own clothes.